So you've been looking all over the place for a knob or leverset with 5 Inch backset? Back in the day a 5 Inch backset was pretty commonly used. These days however, most everything uses the standard 2 3/8" or 2 3/4" backset. 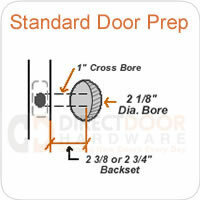 No worries, if you have an older door with 5 Inch backset we can help you out. Kwikset and Schlage still make backsets that will work with most of their handlesets, deadbolts, door knobs and levers. The nice thing is you're not restricted to any particular style, so you can coordinate the door hardware in the rest of your home, with the best matching style of Schlage or Kwikset. Or you can stick with Kwikset or Schlage throughout your home, selecting standard backsets for all of your standard doors, and a 5 Inch backset where you need it. What are my options if I have a 5 Inch backset? In this category there are many options for knobs, levers, handlesets or deadbolts that are available witha 5" backset. You are however restricted to Schlage and Kwikset brands. Unfortunately every brand of door hardware designs their latches a little differently so you can't use a 5" backset from Schlage or Kwikset on something like Emtek or Baldwin. If you can't find anything in the Kwikset or Schlage brands that you like, you really only have the option of replacing your door. 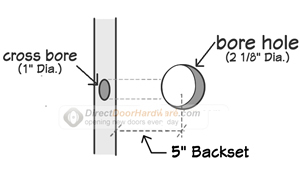 If you happen to have a wooden door, you may be able to patch the old bore hole, sand it smooth and re-bore, but it's not ideal. Your best option is to either start over with a new door which would give you the flexibility to choose whatever style or brand of doorknob, lever or handleset. Of course replacing your door isn't the least expensive option, but there you have it.